We are very happy to offer long arm quilting services to our customers on our Bernina Q20. Many quilters enjoy the piecing part of quilting, and never get their quilts finished, that’s where Mojo Quilts can help. Pricing is done by the square inch, and complexity of the design. You can provide your own Backing and/or Batting for your quilt. If you prefer, Mojo Quilts can provide the batting, we use Hobbs 80/20 this will be $11.00 per yard. Backing fabric will be a basic cotton design that will complement the quilt top; this will be $15.00 per yard. NOTE: Due to the monetary and sentimental value of your quilts, we only ship quilts via U.P.S., FedEx or Express mail for tracking purposes. At this time, we will not be offering binding services for your quilt. We will send your quilt home in a nice zippered bag for protection. Shop Fee: $25.00 minimum. 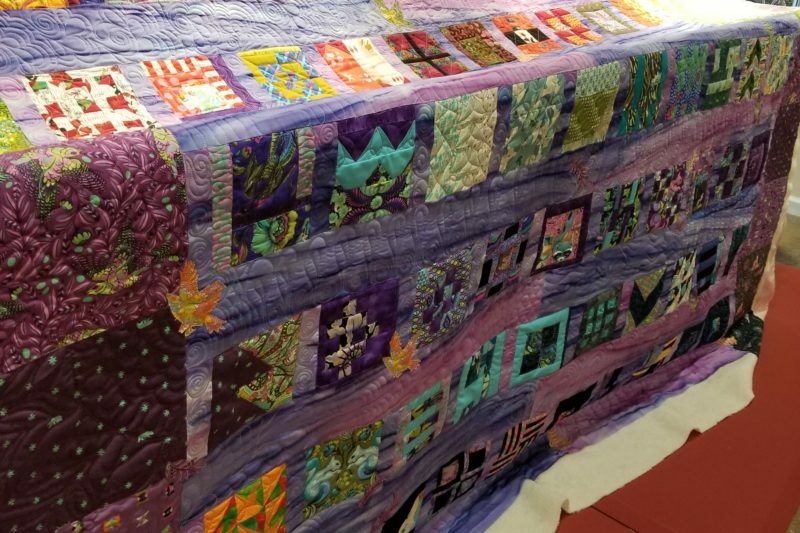 Estimate will be based upon the size of the quilt, complexity of design, and the materials used. To request an estimate, email us at mojoquilts2017@gmail.com, be sure to provide a valid return email address. Mojo Style is my own freehand designs. I often use paisleys, swirls, random feathering, with very dense quilting patterns. For my returning customers that are familiar with my work, they let me have at it and trust that their quilt will be unique. Each piece is evaluated and designs are chosen to fill your quilt from border to border. This may include stitch-in-the-ditch, rippling freehand, meandering, and/or an overall design. Quilting consists of one design repeated across your quilt top, ignoring blocks and borders. I have several Pantographs patterns for you to review and select. Basting quilts is a large stitch in crossing diamonds and lines across the length of the quilt. Thread will be matched as closely as possible to your quilt. There will be a $5.00 minimum charge on thread. Variegated threads will be a $7.50 charge. We like to use cone threads so please do not bring small spools to be used. To Calculate Your Quilt Price measure your width and length X it by the preferred quilting style you want. Standard quilting requires 4″ for each side and 6″ on the bottom. You should properly prepare your quilt before sending it to us, this will ensure you get the best results. Here are a few simple tips to help get your beautiful quilt ready for the final step of its journey. One your quilt top is done, there are a few steps to take to help produce the best possible results. Preparing the quilt top is a team effort. Mojo Quilts wants you to be completely in love with your finished quilt. Once the quilt top is made, look to see if there are seams around the outer edges. If so, baste through these seams about 1/8″ in from the edge.This will ensure the seams don’t pop open when loaded onto the longarm. The binding will eventually cover up these basting stitches too. You may have to baste around the entire quilt if there are multiple seams or just baste through each seam if there are only a few. If the quilt top has a light fabric that might easily show loose threads from the underside, clip those threads. No one wants to see a red thread underneath a nicely quilted area on the quilt top. Some fabrics seem to fray a lot. If you find this is the case, a small dot of Fray Check will help curb those unruly threads! Make sure your quilt top is squared and even on all four sides. Otherwise, it cannot be loaded onto the longarm. Press the quilt top and fold neatly. Ask yourself how your quilt will be used. Do you want the quilting to show or simply hold the quilt together? The batting choice can make a difference, and a good quality batting is very important. We use Hobbs 80/20 batting as a preference. If you send your own batting, please make sure there is enough to extend past the quilt at least 4-5” on all sides. We can discuss this in detail in the pre-quilting stage. You can choose to purchase an extra wide backing fabric, measuring up to 110”, or you could try piecing the back together. The backing can be as simple as an extra strip sewn to one side or pieced together with a few unused quilt blocks or a variety of leftover fabrics. Stitch 5/8” seams when piecing the back and press them open. This helps spread the bulk. The quilt back should measure approximately 4”- 6” larger than the quilt top. Square up the backing on all four sides. Press the backing and fold neatly. Stay away from creating a symmetrical look; this can be problematic once the quilt is rolled onto the machines, it makes it difficult to guarantee symmetry especially if the backing fabric stretches a bit. A solid background is best or an uneven design on the back.